NECKLACE/PIN - SARAH COVENTRY. "OLD VIENNA" FROM 1975. 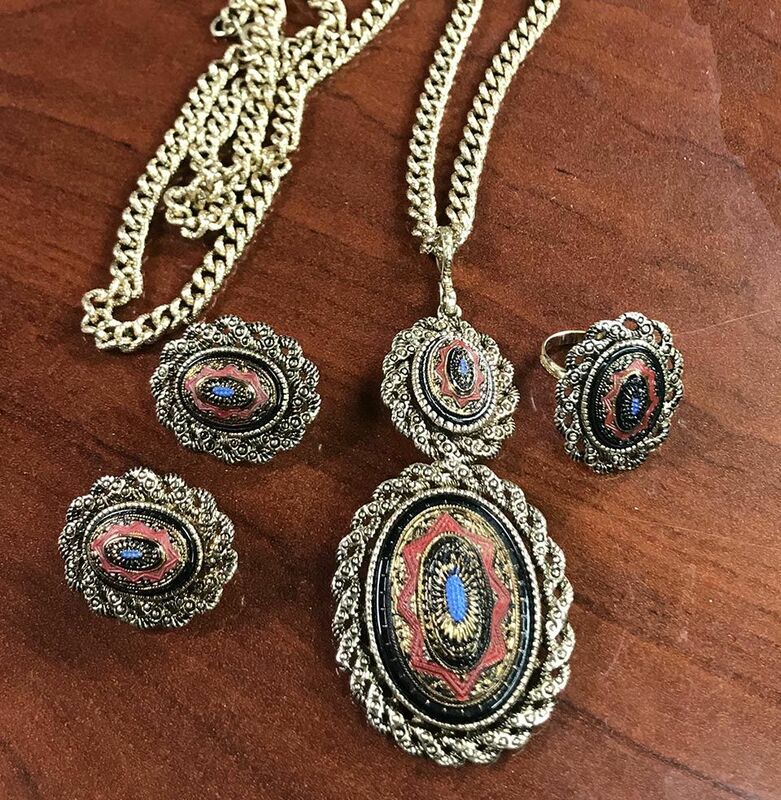 ANTIQUE-LOOK GOLDTONE DOUBLE PENDANT NECKLACEWITH BLACK RED, AND BLUE ENAMEL. WEAR WITH JUST ONE PENDANT OR BOTH, OR WEAR THE LARGER PENDANT AS A PIN. SMALLER PENDANT IS 1 9/16" LONG, 1" ACROSS. LARGER PIN/PENDANT IS 1 13/16" LONG, 1 7/16" ACROSS. CHAIN IS 24" LONG. VERY GOOD CONDITION. EARRINGS - SARAH COVENTRY. "OLD VIENNA" FROM 1975. 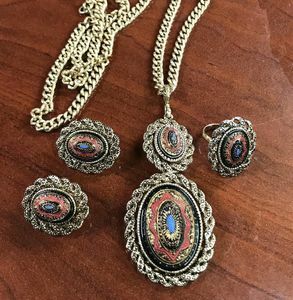 IN A RICH, EUROPEAN FLAIR, ANTIQUE-LOOK GOLDTONE WITH BLACK RED, AND BLUE ENAMEL SHOW OFF YOUR GOOD FASHION SENSE CLIP. 1 1/8" LONG, 7/8" ACROSS. VERY GOOD CONDITION. RING - SARAH COVENTRY. "OLD VIENNA" FROM 1975. IN A RICH, EUROPEAN FLAIR, ANTIQUE-LOOK GOLDTONE WITH BLACK RED, AND BLUE ENAMEL SHOW YOUR GOOD FASHION SENSE. RING TOP IS 1 1/8" LONG, 7/8" ACROSS. VERY GOOD CONDITION. ADJUSTABLE. These items are pre-owned and do not have their original boxes.